Men have condemned God to death; God, however, has by His Resurrection "sentenced" men to immortality. In return for their buffets, He offers embraces; for their insults, blessings; for death, immortality. Never have men shown such enmity for God as when they crucified Him; and never has God shown such love for men as He did in resurrecting. Men wish to render God mortal, but God by His Resurrection designed to make men immortal. The crucified God resurrected and overcame death. Death is no more. Immortality has overtaken man and the whole of his world. Through the Resurrection of the God-Man, the nature of man has been led irrevocably to the path of immortality, and death has thus become fearful. 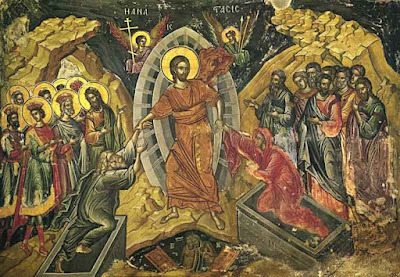 For, before the Resurrection of Christ, death was something feared by man; but after the Resurrection of the Lord, man has become something fearful for death. If a man lives in Faith within the Resurrected God-Man, he lives above death. He stands impregnable by death. Death is transformed into a "footstool beneath his feet": "O death, where is thy victory? O Hades, where is thy sting?" (I Corinthians 15:55). Therefore, when a man in Christ breathes his last, he sheds only the shell of his body, to be clothed with it once again on the day of the Second Coming. Until the Resurrection of the God-Man Christ, death was the second nature of man; the first was life, the second death. Man had become used to death as something natural. But with the Resurrection of the Lord, all things changed: immortality became the second nature of man. It has become something natural to man, whereas death is rendered unnatural. Just as before the Resurrection of Christ it was natural for man to be mortal, so after His Resurrection it has become natural for man to be immortal. Through sin, man was made mortal and limited; through the Resurrection of the God-Man, he becomes immortal and eternal. In this precisely lie the power, the dominion, and the omnipotence of the Resurrection of Christ. Moreover, without the Resurrection of Christ there would be no Christianity at all. Among miracles, the greatest of all is the Resurrection of the Lord. All of the other miracles spring forth form the Resurrection and are centered within it. From it spring forth faith, love, hope, prayer, and godliness. The fugitive Disciples, they who fled far from Jesus when He died, returned to Him when he resurrected. And the Roman centurion, when he saw Christ resurrect from the tomb, confessed Him as the Son of God. It was in this way that all of the early Christians became Christians —because Christ resurrected, because He conquered death. This is that which not one other religion has; it is this, the Resurrection, which exalts Christ above all other men and above all other gods. It is this which, in a singular and indisputable manner, shows and proves that Christ is the only true God and Lord of all the seen and unseen worlds. By the grace of the resurrection of Christ, by the grace of His conquest over death, men became, are now becoming, and will in the future become Christians. All of Christian history is nothing other than that of one singular miracle, the miracle of the Resurrection of Christ, which is eternally contained within the hearts of Christians from day to day, from year to year, and from age to age, until the Second Coming. Man is truly born, not when he is brought into the world by his mother, but when he comes to believe in the Resurrected Savior, Christ; for then he is born into immortality and eternal life, while the mother brings a child only into death, to the grave. The Resurrection of Christ is the mother of all of us, all of us Christians —the mother of all who are deathless. By his faith in the Resurrection of Christ, man is born anew, born into eternity. This is impossible, the skeptic responds. And the Resurrected God-Man replies: "All things are possible to him who believes" (St. Mark 9:23). And one who believes is he who, with all of his heart, with all of his soul, and with all of his being, lives according to the Gospel of the Resurrected Lord Jesus. Our Faith is the victory in which we conquer death; faith, that is, in the Resurrected Lord. "O death, where is thy victory? O Hades, where is thy sting?" "The sting of death is sin" (I Corinthians 15:55-56). By His Resurrection, the Lord "removed the sting of death." Death is the serpent and sin is its sting. Through sin, death injects its poison into the souls and bodies of men. The more sins that a man has, the more powerful the sting by which death injects its poison into him. When a wasp stings a person, the person makes every possible effort to extract the stinger from his body. But when he is stung by death —this sting of Hades—, what should he do? He must, with faith and prayer, call upon the Resurrected Savior, Christ, that He may take from his soul the sting of death. And He, compassionate as He is, will do so, for He is the God of Mercy and Love. When many wasps set upon a man's body and wound him with their stings, a man becomes poisoned and dies. The same thing happens when a man is wounded by the many stings of manifold sins. He who is not resurrected from sin succumbs to death. By conquering the sin within him through Christ, a man conquers death. If a single day passes and you have not yet conquered at least one of your sins, realize that you have become all the more mortal. If, however, you have overcome one, two, or three of your sins, you have become more greatly renewed in that newness that does not age: immortality and eternity. Let us never forget that, for one to believe in Christ, this means that he must struggle ceaselessly against sin, evil, and death. A man demonstrates that he truly believes in the Resurrected Lord by his struggle against the passions and against sin; and if he so struggles, he must know that he struggles for immortality and for eternal life. If he does not struggle, then his faith is in vain. For, if a man's faith is not a struggle for immortality and eternity, then what is it? If by faith in Christ one does not attain to immortality and victory over death, then to what end our faith? If Christ is not resurrected, this means that sin and death have not been conquered. And if these two things have not been overcome, then why should anyone believe in Christ? He who, through faith in the Resurrection of Christ, struggles against his every sin, however, has profound reinforcement within himself of a sense that Christ is in fact resurrected, that He has in fact removed the sting of death, that He has in fact conquered death on all fronts of battle. Sin deeply scars man, draws him near to death, and transforms him from something immortal to something mortal, from something incorruptible and unbounded into something corruptible and limited. The more sins a person has, the more mortal he becomes. And if a man does not feel himself immortal, it is obvious that he is wholly mired in sin, in short-sighted thought, and in dead feelings. Christianity is a call to a struggle to the last breath against death, until, that is, the final victory over death. Every sin is a falling-away, every passion a betrayal, every evil deed a defeat. No one should ask why it is that the Christian succumbs to bodily death. This comes about because the death of the body is a kind of sowing. The mortal body is sown, St. Paul tells us (see I Corinthians 15:42ff), and is raised in power, becoming immortal. Like the seed that is sown, so too the body dissolves, that the Holy Spirit might give it life and perfect it. If the Lord had not resurrected in the body, what benefit would we have taken in this from Him? He would not have saved the whole man. Had He not resurrected the body, then why was He made flesh? Why did He take upon Himself a body, were it not to give to it of His Divinity? If Christ did not resurrect, why should anyone then believe in Him? I confess sincerely that I would never have believed in Christ, had He not resurrected, had He not conquered death, our greatest enemy. But Christ was resurrected, and He gave to us immortality. Without this truth, our world is nothing but a chaotic display of odious stupidities. Only with His glorious Resurrection does our wondrous Lord and God free us from despair and senselessness. For without the Resurrection, there is nothing more senseless in the heavens or under the heavens than the present world; nor is there greater despair than this life without immortality. For this reason, in all the world there is no more misfortunate a being than a man who does not believe in the Resurrection of Christ and the resurrection of the dead (see Corinthians 15:19). "Better for that man if he had not been born" (St. Matthew 26:24). In our mundane world, death is the greatest torment and the most hideously cruel thing. Freedom from this torment and cruelty is precisely what salvation is. Such salvation was given to the generation of man only by the Conqueror of Death, the Resurrected God-Man. Through His Resurrection, He revealed to us the whole mystery of our salvation. Salvation means to be guaranteed immortality and eternal life for the body and for the soul. But how do we succeed in this? Only in the life of the God-Man, in the life of the Resurrection, through the Resurrected Christ. For us Christians, life on this earth is a school in which we learn how to secure for ourselves immortality and eternal life. For of what benefit is this life, if we cannot attain to eternity within it? But for a man to be resurrected with Christ, a man must first die with Him and live the life of Christ as his own. If he does this, then on the Day of Resurrection he may say, along with St. Gregory the Theologian: "Yesterday I was crucified with Christ, today I am glorified with Him; yesterday I died with Him, today I am given life with Him; yesterday I was buried with Him, today I rise with Him." And in a few single words we may summarize the four Gospels of Christ: "Christ is Risen! He is Risen Indeed!" In each of these words one can find the Gospel of Christ, as in the four Gospels one may find all of the knowledge of the whole of God's world, both known and unknown. And when the feelings of man, along with all of his thoughts, are centered on the thundering din of the Paschal greeting, "Christ is Risen!," then the joy of immortality moves all things, and all things in rejoicing proclaim the Paschal miracle: "Indeed He is Risen." Yes, Christ is indeed risen! and a witness of this is you; I am a witness; every Christian is a witness of this, beginning with the Apostles and reaching up through the Second Coming. Because only the power of the Resurrected God-Man Christ can give —and continually gives now and will continually give in the future— the power to each Christian, from the first to the last, to conquer all that is mortal, and by this death itself; all that is sinful, and by this sin itself; and all that is demonic, and by this the devil himself. For simply by His Resurrection, the Lord, in the most convincing way, showed and proved that His life is Eternal Life; His love, Eternal Love; His good, Eternal Good; His truth, Eternal Truth; and His joy, Eternal Joy. He also showed and demonstrated that all of these things He gives, in His incomparable love of mankind, to every Christian in every age. With regard to these things, there is not a single event, not only in the Gospels, but in the entire history of the human race, to which greater testimony has been given, in a manner so forceful, so unimpeachable, and so undisputed, than the Resurrection of Christ. Without doubt, Christianity, in all of its historical reality, in all of its historical force and omnipotence, has been established on the fact of the Resurrection of Christ, that is, on the Hypostasis of the God-Man Christ in Eternal Life. And to this all of the long and ever-miraculous history of Christianity bears witness. Indeed, if there is one fact with which one could summarize all of the events in the life of Christ and of the Apostles, and more generally in all of Christianity, that event would be the Resurrection of Christ. Moreover, if there is a reality which summarizes all of the realities of the New Testament, that reality would be the Resurrection of Christ. And finally, if there is one miracle in the Gospels which can be said to summarize all of the miracles reported in the New Testament, that miracle would be the Resurrection of Christ. For only within the light of the Resurrection are the person of Jesus Christ and His work made miraculously known. Only within the light of the Resurrection are the miracles of Christ, all of His truths, all of His words, and all of the events of the New Testament fully explained. Up to the time of His Resurrection, the Lord taught about eternal life; but in the Resurrection, He shows us that He Himself is Eternal Life. Up to the time of His Resurrection, He taught about the Resurrection from the dead; but in the Resurrection, He showed that He Himself was indeed the resurrection of the dead. Up to the time of His Resurrection, He taught that belief in Him took one from death to life; but in His Resurrection, He showed that He Himself had conquered death and had thus assured those afflicted by death of passage from death to resurrection. Yes, O indeed, yes: the God-Man Jesus Christ, by His Resurrection, showed and demonstrated that He is the only true God, the only God-Man among all humankind. And something further: without the Resurrection of the God-Man, it would be impossible to explain the witness of the Apostles, or the martyrdom of the Martyrs, or the confessions of the Confessors, or the holiness of the Holy, or the ascetic labor of the Ascetics, or the wonders of the Wonder-Workers, or the faith of the Faithful, or the love of those of love, or the hope of the hopeful, or the prayer of the prayerful, or the repentance of the repentant, or the mercies of the merciful, or any Christian virtue or labor. Had the Lord not risen as the Resurrected One and had He not filled His Disciples with life-giving power and miraculous wisdom, what could have brought these cowardly and fugitive men together, giving them the courage and the strength and the wisdom so fearlessly to preach and to confess the Resurrected Christ and to go with such joy even to death on His behalf? And if the Resurrected Savior did not fill them with His divine power and wisdom, how could they have ignited in the world the inextinguishable fire of the New Testamental Faith, these simple, unlearned, and poor men? If the Christian Faith were not a faith in the Resurrection and, as a consequence, in the Eternally-Living and Life-Giving Lord, who would have been able to inspire the Martyrs in the feat of martyrdom, the Confessors in the feat of confession, the Ascetics in the feats of asceticism, the Unmercenaries in the feat of penury, the Fasters in their feats of abstinence, and any Christian in any Christian feat? Thus it is that all of these things are true for me and for every human being —through the Resurrection of Christ. The Wondrous and Sweet Jesus Christ, the Resurrected God-Man, is the only Being under the heavens in whom man here on earth can conquer death and sin and the devil and come to blessedness and immortality —becoming a partaker, indeed, of the Eternal Kingdom of the Love of Christ. For the human being, the Resurrected Christ is the all in all throughout mankind: all that is Beautiful, Good, True, Precious, Harmonious, Sacred, Wise, and Everlasting. He is all of our Love, all of our Truth, all of our Joy, all of our Life, the Eternal Life unto all the sacred eternities and infinities. Translated from the Greek by Bishop [now Archbishop] Chrysostomos of Oreoi [now of Etna]. From a series of theological essays, Anthropos kai Theanthropos (Athens, 1970). The Greek text is a translation of the Serbian original. Translation appeared in Orthodox Tradition, Vol. 4, No. 2 (1987), pp. 38-42.